This is a 1934 studio portrait of Phil Zimmerman, a long-time Topeka resident who was prominent for his involvement in civic and political affairs and for his energetic promotion of a variety of causes. Zimmerman was born in Kahoka, Missouri in 1879. In 1885, his family moved to Chase, Kansas, where his parents first operated a hotel and later farmed. During the Spanish-American War, Zimmerman enlisted and served in the 21st Kansas Regiment. In the early 1900s, he worked several years for the Hagstrom Brothers Manufacturing Company in Lindsborg, first in sales, then in advertising and management. Zimmerman was an early motorcycle enthusiast who worked for a time as a sales representative for a motorcycle manufacturer. He also served as secretary-treasurer for the Short Grass Motorcycle Club during the club's heyday and was a leader in promoting its activities. In the late 1910s, Zimmerman headed a statewide Anti-Bolshevik league. He was a long-time Republican Party activist. He supported Teddy Roosevelt's Progressive Party presidential bid in 1912, worked in numerous gubernatorial campaigns, and was a state organizer for the National Republican League. In 1925, he was appointed Kansas Hotel Commissioner. Afterward, he accepted a job as a traveling salesman for a chemical company. 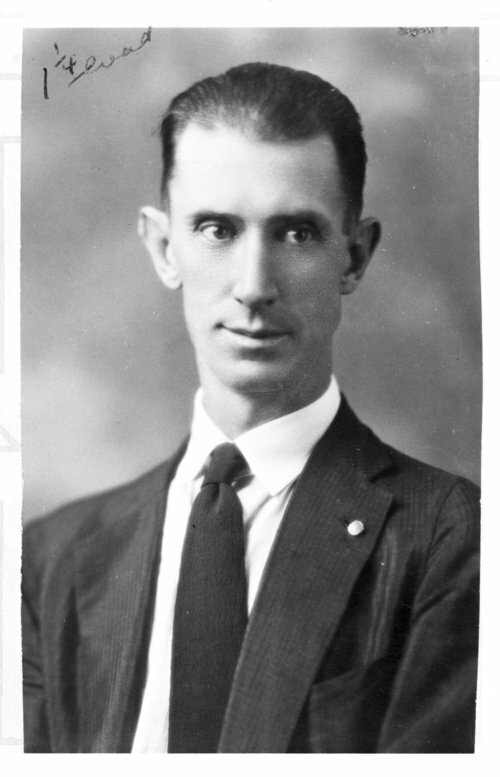 Zimmerman moved to Topeka in 1925 and settled there permanently. He was active in veterans' organizations and was associated with several causes. He founded the National Society of Long Fellows to advocate for the interests of tall men, and was well-known for his horticultural projects, including a campaign to distribute packets of flower seeds throughout the world. Phil Zimmerman died in Topeka on December 8, 1965. This is a 1934 studio portrait of Phil Zimmerman, a long-time Topeka resident who was prominent for his involvement in civic and political affairs and for his energetic promotion of a variety of causes. Zimmerman was born in Kahoka, Missouri in 1879. In 1885, his family moved to Chase, Kansas, where his parents first operated a hotel and later farmed. During the Spanish-American War, Zimmerman enlisted and served in the 21st Kansas Regiment. In the early 1900s, he worked several years for the Hagstrom Brothers Manufacturing Company in Lindsborg, first in sales, then in advertising and management. Zimmerman was an early motorcycle enthusiast who worked for a time as a sales representative for a motorcycle manufacturer. He also served as secretary-treasurer for the Short Grass Motorcycle Club during the club's heyday and was a leader in promoting its activities. In the late 1910s, Zimmerman headed a statewide Anti-Bolshevik league. He was a long-time Republican Party activist. He supported Teddy Roosevelt's Progressive Party presidential bid in 1912, worked in numerous gubernatorial campaigns, and was a state organizer for the National Republican League. In 1925, he was appointed Kansas Hotel Commissioner. Afterward, he accepted a job as a traveling salesman for a chemical company. Zimmerman moved to Topeka in 1925 and settled there permanently. He was active in veterans' organizations and was associated with several causes. He founded the National Society of Long Fellows to advocate for the interests of tall men, and was well-known for his horticultural projects, including a campaign to distribute packets of flower seeds throughout the world.